The Curva Nord represents for us a sacred space, an environment with an unwritten code to be respected. The first few rows, as always, have been experienced like the trenches. In the trenches, we do not allow women, wives and girlfriends, so we invite them to position themselves from the 10th row back. Those who choose the stadium as an alternative to a carefree and romantic day in Villa Borghese [public gardens in Rome], should go to other sections. A Lazio spokesman told the Italian news agency ANSA that the Irriducibili’s views are “not the position of the club,” and that the team is against such forms of discrimination. The existence of this flyer isn’t all that surprising given Lazio supporters’ long history of disgraceful behavior. In an incident last season, Lazio fans covered their home stadium, the Stadio Olympico—which they share with arch rival AS Roma—with images of Anne Frank in a Roma uniform. 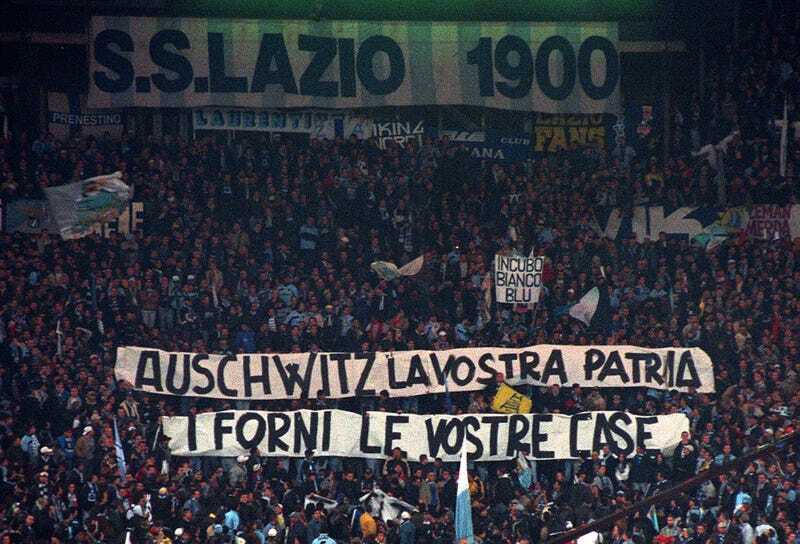 The photo was accompanied with a caption saying, “Roma fans are Jews.” During a 1998 derby between Lazio and AS Roma, Lazio supporters held up a banner that read, “Auschwitz is your town; the ovens are your houses,” in a reference to Roma’s association with the Testaccio neighborhood of Rome—known for its Jewish population. Lazio fans have been reprimanded countless of times for derogatory taunts aimed towards opposing players, particularly ones of African- or Jewish-descent. Tottenham Apologize For Survey Asking Fans Whether "A Woman&apos;s Place Is In The Home"